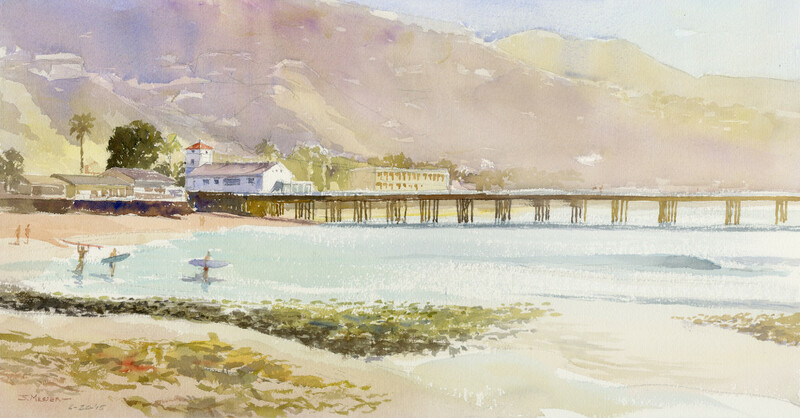 Watercolor painting has always been an irresistible draw for California artist Jon Messer. He loves to paint the interplay of light and shade across a textured surface. The mood created when sunlight warms the earth. A brilliant sunrise, a foggy afternoon, a clear as a bell California summer afternoon, long winter shadows. Whether the scene is of boats moored in Marina del Rey, the historic theaters of downtown Los Angeles, the lifeguard towers in Malibu, the California coastline, or the giant rock at Morro Bay, Jon Messer’s paintings are always about the quiet presence of the sun. As a medium, watercolor is a compelling proposition. It has so many qualities and there are so many different techniques to master. It is a medium that has the ability to challenge, surprise, and intrigue an artist for life. The magic of California has played a dominant role in Jon’s life since he moved here at the age of twelve. The beauty of the state, its wonderful climate, and abundant outdoor opportunities for adventure: the surfing, sailing, hiking, biking, and horseback riding. The architecture, landscape, coastline, and people of California are the figurative themes of Jon Messer’s life as well as his artwork. Watercolor is his main medium of expression. He relies on the confident use of perspective to convey depth and reality but light, shade, and shadow are the spiritual inspiration for all of his work. Painting in the studio, as well as Plein-air, inspires him to capture the scenes he loves. With a gentle climate and landscape that reaches from the ocean to the mountains, Los Angeles has a living character that defies simple definition. It has a relatively short history of development from a pueblo into a sprawling city with diverse industries that have changed the story of the whole country –Aviation, Entertainment, and Science – all advanced by dedicated and innovative people who continue to come here from around the world. Jon has lived in Los Angeles since 1968, yet he hasn’t run out of inspiring scenes and hidden treasures to discover and paint.